Yes, Daddy-O, it's the long-awaited issue you've been waiting for! It's Showtime! Coverage of NNL East, the Mid-Atlantic NNL, and the Cruisin Nationals Model Car Show out West! 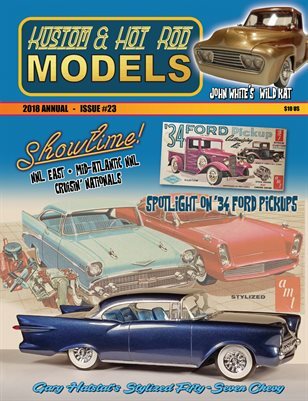 Special coverage on 1934 Ford pickup models from all over, a feature of the model of the Barris Wildkat pickup, and the Blue Hawaii retro style 1957 Chevy! How about Drag City Castings tuck n roll resin interior for the 53 Ford pickup? What more could you ask for?